Follow these six simple tips to get the most out of your coffee beans! 1. Avoid contact with air! This is the most basic yet important rule of storing coffee, as the more contact the coffee bean has with air the more flavour it loses. 2. Avoid heat – don't keep your coffee next to an oven. The heat will cause the coffee to lose flavour. 3. 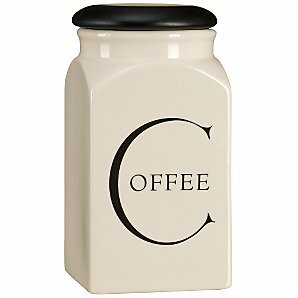 Store the coffee in air-tight containers. Ceramic or glass are good as they are non-absorbent. 4. Don't buy too much! Try to only buy enough coffee for one – two weeks, as after this time the coffee will have lost most of its flavour. 5. Iif you have bought more than two weeks' worth, then freeze it. However, don't refreeze after you've taken it out. Divide up the coffee beans into small amounts so you don't waste any. 6. Don't keep your coffee in the fridge. Coffee absorbs odours and will absorb any smells in the fridge. However, this is a perfect use for used coffee grounds.